Julie and I have been on a handful of trips to the state of Washington. 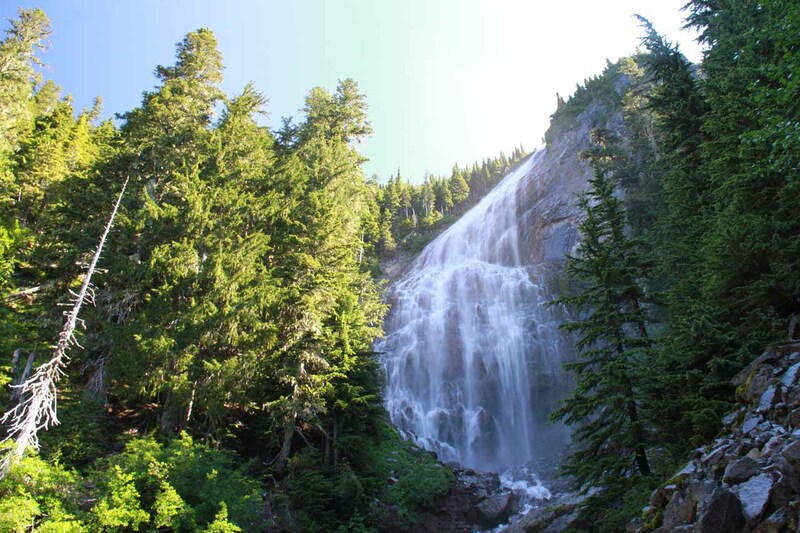 So we feel that we have enough of a library of waterfalling experiences to put together this list of Top 10 Best Washington Waterfalls. Unlike our list in the neighboring state of Oregon where the Columbia River Gorge had a large concentration of waterfalls, the ones we found in the Evergreen State were all over the place. Indeed, we scattered about from locales like the Gifford Pinchot National Forest to the Olympic Peninsula to the Northern Cascades as well as Mt Rainier. In any case, we stuck with our convention that we only consider waterfalls that we’ve personally visited. As always, this list will certainly change as we continue to make more visits. 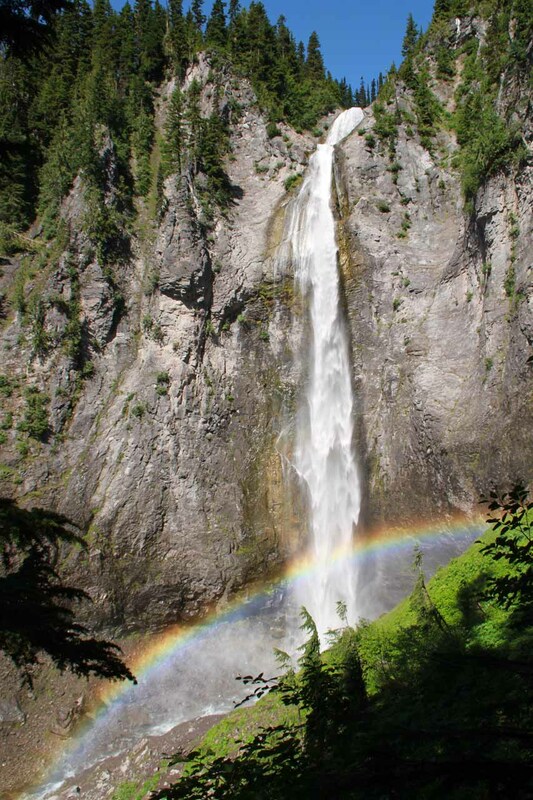 Proclaimed as the tallest waterfall in Olympic National Park at nearly 100ft, this thin beauty held its own against other contenders in the state. However, our visit included other unexpected surprises, which helped nudge this onto our top 10 list of favorites in the Evergreen State. Indeed, we witnessed tall and wide old growth trees as well as the waters of Lake Crescent. The presence of moss and ferns everwhere also affirmed the high rainfall of this temperate rainforest of the Olympic Peninsula. As much as we thought we had visited a lesser-known part of Washington, this place’s popularity quickly made us change that preconceived notion. I guess we shouldn’t have been surprised given all that we experienced here. Standing before the iconic Mt Rainier, this waterfall had that rare characteristic of allowing us to take that photograph of both features together! Situated just a little over a quarter-mile walk on a mostly paved trail from the main part of Mt Rainier National Park, I had to believe this was also one of the busier waterfalls on this list. Nonetheless, this atmospheric walk allowed us to glimpse glaciers reaching down the snowy peak of one of the Cascades’ signature mountains, while the waterfall provided the excuse to really enjoy this convergence of beauty. 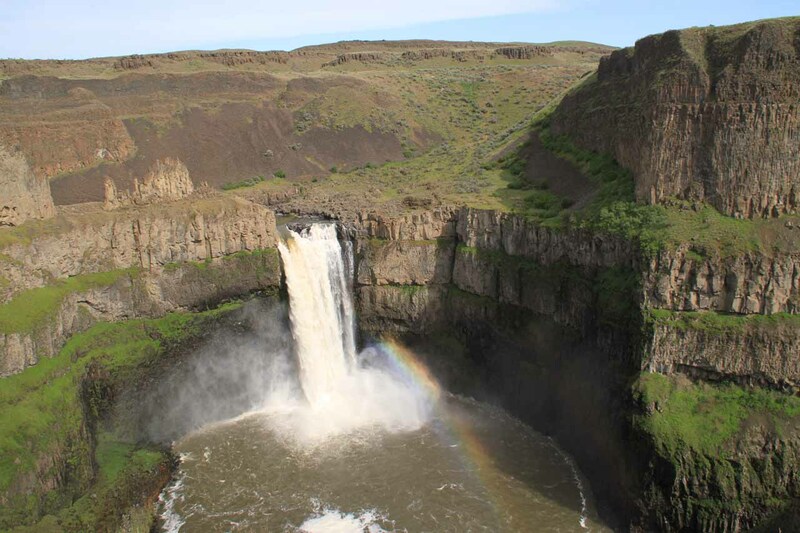 And that brought up everyone’s mood to the point that we had to include this well-situated waterfall on our top 10 list of Washington’s best. 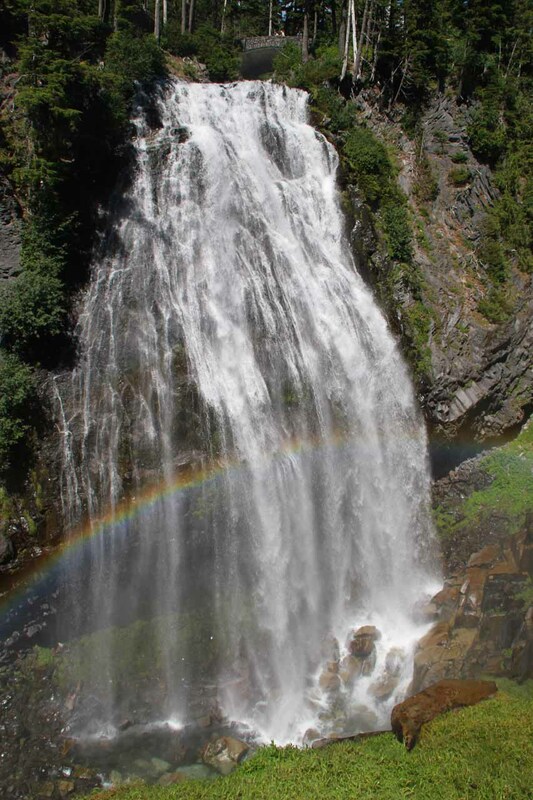 This underdog waterfall lacked the size of other waterfalls that made this list. However, we found that the falls brought a lot to the table with its rainforest settings featuring very tall old-growth trees. In fact, Julie and I found all the bright greenery along the trail as well as the falls itself seemed complement each other very well. Indeed, this could very well be one of those rare instances where sunny weather might not suit this waterfall as much as the typical gray and misty weather the Olympic Peninsula tends to experience. And since we happened to experience this falls under such wet conditions, we savored the clean air, the radiant greens, and the sense of well-being in witnessing places like this. And thus, we had to put this falls on our list of favorites from Washington. 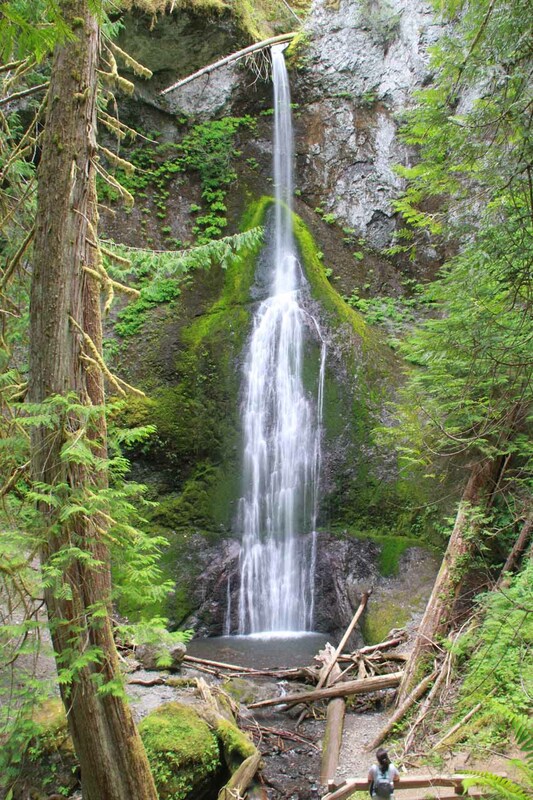 This was the southernmost of the waterfalls that sit on this list of Washington’s best. We actually made our visit as we drove from the Columbia River Gorge to the Windy Ridge section of Mt St Helens. And as you can see from the photo, this 250ft waterfall in two main tiers impressed us with both its size and its rather unique shape. Plus, our visit didn’t feel crowded (especially compared to the more convenient attractions in the Columbia River Gorge) so the overall experience just felt right. Thus, we had no problems putting this waterfall on our top 10 list of best Washington Waterfalls. 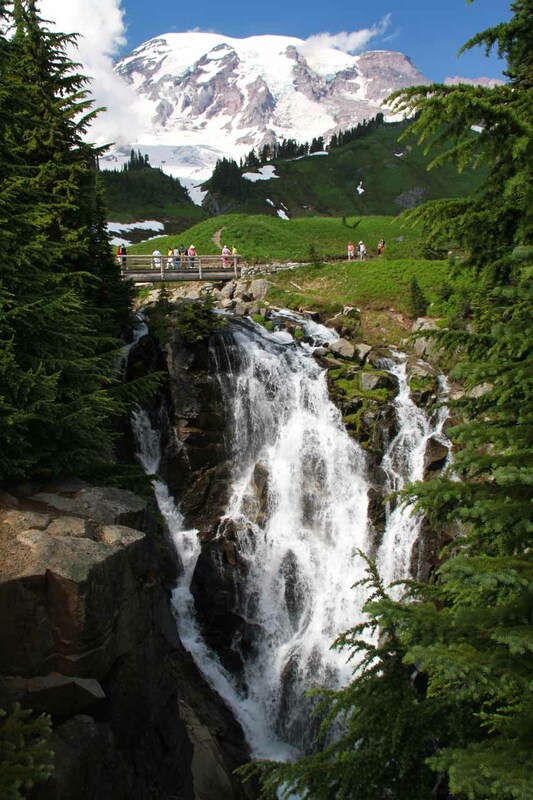 Julie considered this wide 241ft waterfall on the slopes of Mt Rainier as her favorite one in the park. In addition to its convenience (as it sat almost roadside), our visit happened to yield a bold bright rainbow across its misty base. And after doing a relentlessly uphill hike for one of the other waterfalls on this list, I think Julie relished the fact that we witnessed such a pleasing waterfall without the big effort to access. 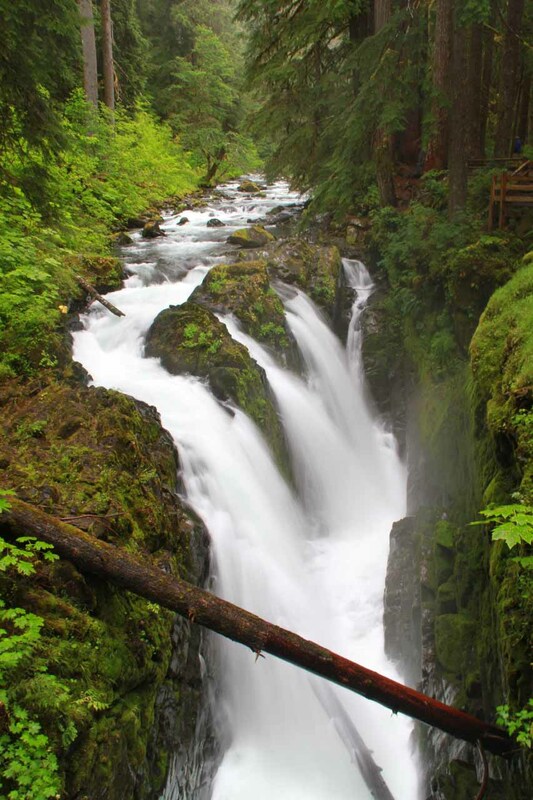 So adding it all up, this waterfall certainly belonged on our list of the top 10 best waterfalls in Washington State. This waterfall was really three waterfalls on a single hike. 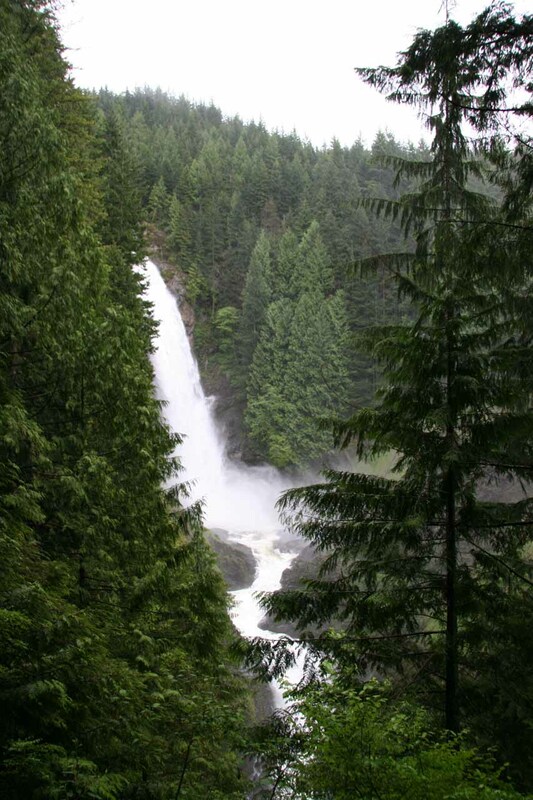 Situated almost directly to the east of Everett near the town of Gold Bar, I found myself enjoying the thick evergreen forest in classic Cascades scenery. Each of the waterfalls also exhibited differing characteristics. So all the stops to along the way to the uppermost waterfall definitely ensured that I didn’t have a dull moment on the five-mile round-trip hike. 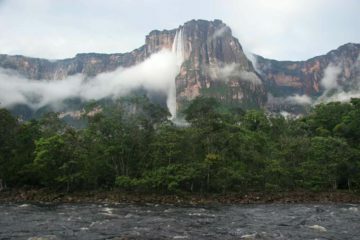 The main waterfall (pictured here) was actually the middle waterfall, which boasted a 260ft drop. The uppermost waterfall had a pair of drops at over 100ft total. 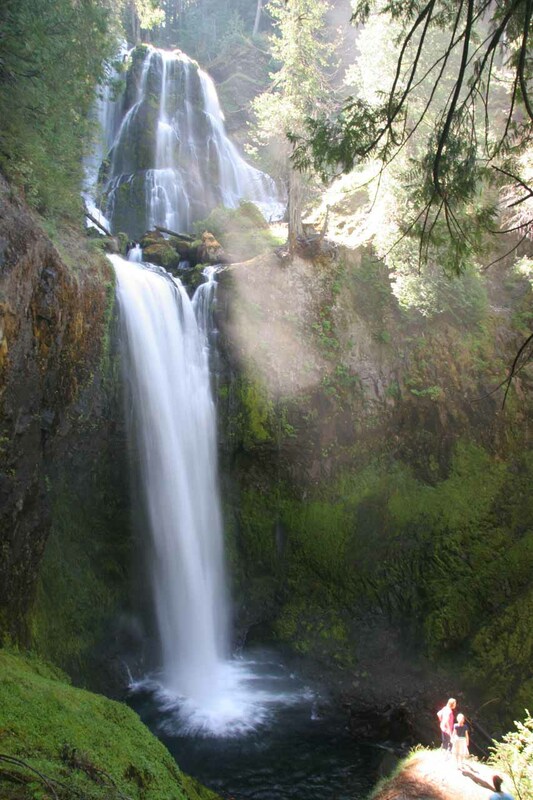 Putting it all together, I just had to place this series of waterfalls on our list of Washington’s best. Easily the most popular waterfall in the state of Washington (due to its close proximity to Seattle), we couldn’t deny its power and accessibility. Indeed, with a 268ft drop and enough force to toss up mist all the way back up the gorge, the Puget Sound Power and Light Company definitely made use of that power. Just imagine how much wilder this waterfall would perform without the regulation! Nevertheless, it felt like every time we visit relatives and friends in Seattle, we have to make an obligatory stop here. 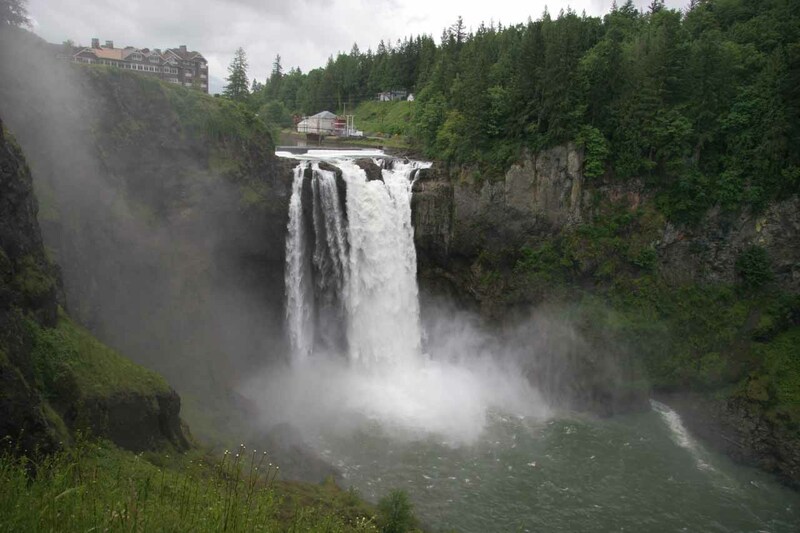 Thus, no list of the Evergreen state’s top waterfalls would be complete without it. This plunging 320ft waterfall made us earn it with a pretty relentless uphill hike. At least throughout most of the climb, we witnessed many cascades on Van Trump Creek. With the bounty of waterfalls on this hike alone, we definitely had to make sure to not prematurely turn around at the uppermost of the Van Trump Falls. For once we finally made it to this towering monster, we happened to time our visit perfectly for a bold bright rainbow along with the contrast of clear blue skies. To extend our visit, we could have sweated even more to get up to an alpine meadow upstream of this waterfall. Still, the falls itself provided enough endorphins for the good vibes so we had no issues placing it near the top of our list of Washington’s best. As you can see from the photo, I had to place this nearly 300ft mammoth waterfall high up on this list given its size as well as its unique twisting shape. Even though it shared the same reserve and political boundaries as other waterfalls on this list, I actually had to visit the more remote north-face of Mt Rainier near Mowich Lake to get here. The hike itself featured teasing glimpses of the imposing glacier-covered slopes of Mt Rainier as well as jumbles of hexagonal blocks of basalt that have flaked from the volcano over the years. In order to get the view you see here, I also had to cross a swollen Spray Creek, which experienced unusually Spring-like conditions in mid-August of 2011. Even the wildflowers bloomed in full force at the Spray Park alpine meadow further upstream of this waterfall. Indeed, taking all these things together, this waterfall definitely belonged near the top of our top 10 list of best Washington Waterfalls. Of all the waterfalls on this list, none had quite the raw and wild scenery as this gushing 180ft waterfall. During our visit, the desolate surroundings and deep gorge cut by the Palouse River reminded me very much of the kind of scenery I would have expected to find in Iceland. Plus, we managed to enjoy the waterfall from a variety of viewing angles, including a scary edge-on view from the so-called “Mohawk” just above the waterfall’s brink. Given all the special characteristics this waterfall had going for it, I had to crown our list of Top 10 Best Washington Waterfalls with this one.